Things that are important to us, part one: Beer! We love beer, its traditions, its variety, its natural ingredients and magical brewing process. We love the look of a pint, the smell of a brewery and the taste of a well-kept glass of beer after a hard day’s work. We love light ales, golden ales, ruby ales and dark ales. We love stouts, porters, bitters, IPAs, APAs, milds, wheat beers, saisons, lambics, lagers, pilsners and brown ales. We especially love black IPAs at the moment, but that will probably change at some point. Beer is, as most people know, a happy accident, discovered by chance and wild fermentation – the precise origins lost in ancient history. At times considered a magical or holy process, brewing turns the most simple of natural ingredients – water, malted barley, hops and yeast – into the headiest mixture of often pure crystal clarity and delightful taste. Here in England we’re exceptionally lucky right now. The long tradition of ‘real ale’ has made a stunning resurgence from the dark days of the 1970s and 1980s, thanks in large part to CAMRA, the Campaign for Real Ale, whose members lobbied parliament and the breweries, and forced the industry to confront the questions of how their beer was made, and how good it tasted, not just how much profit they could make from it. Since then, thousands of small breweries have been saved, re-started or just opened anew by beer enthusaists and skilled brewsters alike. But that’s not all. Intertwined with what you might call the ‘British tradition’ of real ale, we now have imfluences from America, where post-prohibition homebrew hippies grew up and decided to turn their hobby into a way of life, and started up breweries. The different conditions in America, not least the huge distances the beer would need to travel, led these brewers to embrace more modern production and storage techniques, but always with taste and variety to the fore. Thus was born a ‘craft beer’ movement, which has now crossed the Atlantic back to the place it arguably all began. So we now have ‘real ale’ and ‘craft beer’, and while the two may not alwayssee eye to eye on every technicality of production process or storage method, there’s no denying that they combine to offer us a huge range of quality beers, brewed by small producers concentrating on maximising quality and taste not profits. There are thousands of such breweries all over the UK, and we’re blessed in where we happen to be because some of the very best breweries are right here on our doorstep. We’ll write more in a day or two about how important the environment is to us (let’s just say we’d like our grandchildren to appreciate the special beauty of the local countryside without having to look it up in a book, and leave it there for now) but one of the decisions we’ve made, to try to keep the Geese and Fountain making a positive impact on the environment, not a harmful one, is to only work with breweries who are local to us. Shopping local has become a huge issue in recent years, and we’re very lucky in the Vale of Belvoir to have amazing farms to source our food for the kitchen and amazing local breweries to source our beer. So we’ve decided we will take regular orders exclusively from breweries based within 40 miles of the pub. That may sound restrictive, but in fact there are some world class brewers and brewsters right on our doorstep, and we want to be able to showcase their beers to an appreciative audience. We’ll also have cider from Leicestershire, Rutland and Nottinghamshire. Some of these breweries are new and exciting. Some are established and world-class award winners. They all make great beer, and we’re very, very pleased to be working with them. There’s a long list of other quality breweries locally that we just cannot fit into one weekend, but we’ll have brews from them as soon as we can arrange it. What this does mean is that there’s no room on our bar for the national brands that you’re maybe used to seeing in other places. There’ll be no Carling or Carlsberg, no Guinness, and no John Smiths. We think that there are enough places selling beer like that already. What Leicestershire and the surrounding countryside needs is more pubs selling beer made in Leicestershire, Lincolnshire and so on. We also think that these local brews offer more choice, more variety and more interesting flavours. With up to eleven different beers and lagers on tap at any one time we‘re confident that everyone will find something to their taste from our selection. For bottled beers we are going slightly further afield. We’ll have some of the best bottled (and canned) beer from the UK, Belgium, Germany, France, even the USA and the southern hemisphere. But there’ll always be something special about everything that makes it onto, or behind, our bar. We won’t ever sell a product because of its nice packaging or its marketing budget. We’ll only sell a beer because of how its made, who makes it and, above all, how great it tastes. We’re going on an exciting beer journey over the next few years with the Geese and Fountain. 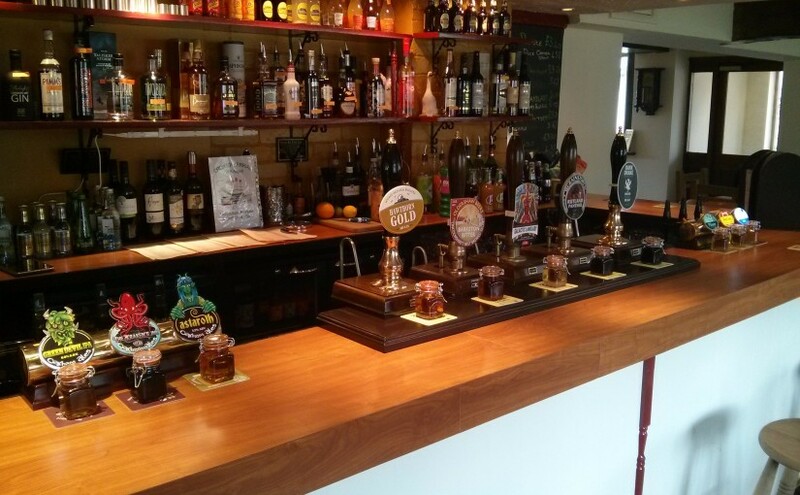 Every day there’ll be new beers arriving either on draught or in bottles or cans. Always something new to try. We can’t promise you’ll like everything we sell. But we can promise we’ll keep finding you new and flavourful beers to get excited about. And we’ll do good for our local community, and the planet, while we do it. Previous Previous post: What’s on at The Geese in January?